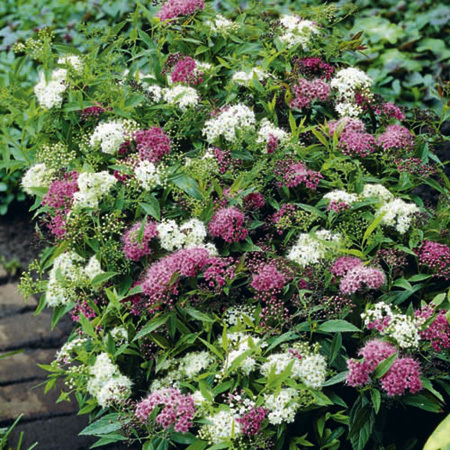 Create your own low growing pollinator hedge or an area divider with our stunning spiraea shirobana shrub plants and watch them flower up to autumn. This truly amazing spiraea variety produces flower heads (made up of many small individual flowers) that change colour as they age, meaning you'll have blooms of pink, white and almost red, at the same time, giving the plant a completely unique look! Flowers June-August. Height 50-60cm (20-24"); spread 40-50cm (16-20”). Supplied in a 2 litre pot. Three different coloured flowers on one plant! Ideal for beds and borders, patio pots and containers. Attractive to bees. Grows well in sun or shade.